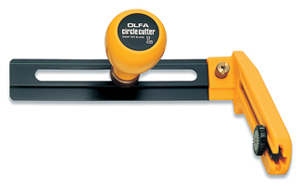 OLFA Compass Cutter Heavy Duty Circle Cutter CMP-2 Model 9902 is designed to cut circles from approximately 3" to 12" diameter. Easily adjusts to accommodate users requirements. 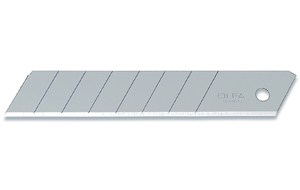 This cutter is perfect for scribing circles necessary for the installation of recessed lighting. Besides scribing drywall, the cutter can cut or mark cardboard, mat board, and thin plywood. This cutter uses super sharp heavy duty snap-off blades that allow you to simply snap-off a dull cutting edge and advance the new cutting edge. Also the perfect cutter for making half moon wind vents in banners. Simply cut 4" to 8" diameter 1/2 moon windslits in the center of the banner. CARPET INSTALLERS - Another suggestion for using the CMP-2 is to load it with an OLFA LH-20B Hook blade and carpet repair is as easy as turning your wrist. As you know, when a small section of carpet is damaged from a burn or stain, a circle patch is removed. When cutting with a straight blade it puts a bevel on the cut, but when using the hook blade in the CMP-2 it cuts from the bottom of the carpet and makes a clean cut and then it can be replaced with another piece which is also cut with the CMP-2. From the surface you will not see the repair that has been made. This product is also excellent for cutting materials ranging from cardboard, paper and acetates to heavy rubber gasket material. Also great for cutting wind slits in banners. Comes with 1 LB blade. 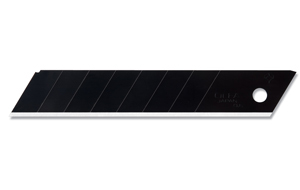 Uses replacement blades LB, LBB, L-SOL, and LH-20B.